Best Heavy Duty Garden Fork: Dig into It. 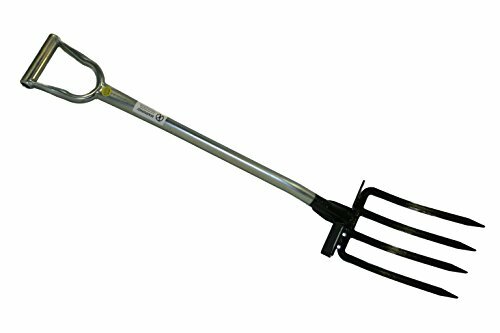 After a thorough look at the market for garden forks, we’ve found that the best heavy duty garden fork is the Radius Loop-Handle Garden Fork. The O-loop is unique, allowing a variety of hand positions when digging that allow for shifts in posture. It’s covered under a lifetime warranty and is made of high-quality steel. Ordinarily, Fiskars would be at the top of our list (see below), but in this case, the plastic handle on Fiskars’ fork is a bit of a letdown and is bested by Radius’ offering. For further information on the Radius, see the Product Reviews section below. Our runner up for best is the spading fork from Hoss. The idea of “aircraft grade” tubing as a shaft material, and the metal parts of the handle are a real draw. The rest of the spade is fairly standard construction, except for one little feature: a pad on the shoulder of the tines to cushion your foot when pressing down with it. 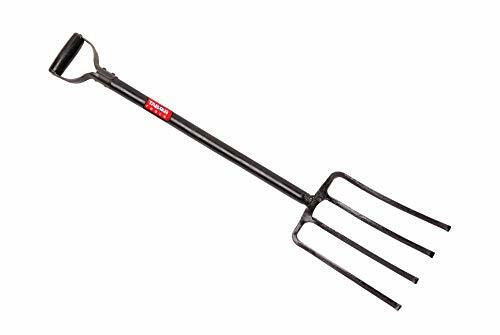 For further details on the Hoss garden fork, see the Product Reviews section below. A good budget pick is the Truper Tru spading fork. Truper is the latest incarnation of a Mexican company that has partnered with American companies such as Tru Temper tools in the past. With fifty years of tool making experience behind them, Truper puts out an excellent line of traditional tools. Their spading fork incorporates traditional design features such as an ash handle. In spite of being an import, it is still priced lower than the American made Hoss, or the organically oriented Radius. To learn more about the Truper spading fork, head to the Product Reviews section below. When looking for the best heavy-duty garden fork, there are two primary targets you are seeking: rugged indestructibility in construction and comfortable design. A spading fork is a perfect tool for many jobs around the yard and garden. These include turning compost bin, fluffing up permanent beds, aerating soil around trees and even in your lawn, and digging out root crops from garden beds. A spading fork is useful when grubbing out sprouts, but it is often not your best choice of tool for hardened, compacted earth. It is more robust than a pitchfork or even a manure fork, although it can double for the latter. If you require a tool that will loosen sod, pry out tough roots and rocks or gently sift out root crops, then a spading fork is the tool for you. There are a few considerations to keep in mind when shopping for a garden fork. Here are the most important aspects to focus on. The most difficult part when purchasing a standard digging fork is the handle length. The short handle can be somewhat inadequate for a tall person since most are around 40 inches in length. For a shorter person, a 30-inch shaft is a great fit. It is a good idea, however, to keep height in mind when you are purchasing hand digging tools of any kind. You might also want to keep in mind that a shovel or spading fork is not intended for heavy prying. Even so, you want one that will hold up to clay and the occasional rock or root. You’ll be putting a lot of pressure on the handle, continuously, so you want a handle that is comfortable to hold, and sturdy. The two most common handle designs are O-Shaped and D-Shaped. The D provides a flat grip, while the O has a curved grip. To a degree, the best handle shape is personal preference, but we find that the O-shape tends to feel more comfortable with prolonged use, and from a variety of angles. Most of the heavy duty forks on our list today are made of steel, though some of the manufacturers use different materials for the shafts and handles. Steel is, of course, a very robust material, but may be a bit uncomfortable to hold. Other materials like plastic may be more comfortable, but are quite a bit weaker, and are potential points of failure down the road. Different manufacturers target various levels of sharpness when it comes to spading fork tines. Of course, dull tines are much safer to keep around, though sharp tines make working in compacted soil or getting at several layers of straw bedding, In addition, some heavy duty forks have chisel-shaped tines, creating a balance between sharpness and safety. It is difficult to go wrong when purchasing a spading fork. Your primary needs are sturdy, durable parts that will hold up to prying and lifting on tough roots, rocks and other obstructions. If you turn your ground-based compost bin or if you muck out a stable on a regular basis, a spading fork is a handy item to have on hand. We’ll start with a comparison table to get an overview, and then dig into individual reviews. We’ll conclude with our favorites. Fiskars is one of those names that just radiates yard and garden (for example, we love their splitting axe). When you see the name, you know you are looking at quality, and the D-handle garden fork is no exception. With that said it should be noted that only the fork and shaft are made of steel. In this tool, the D-Handle is plastic. Many find this a letdown, and the handle is certainly a point of failure. Even so, it is a sturdy unit that can be used to turn compost, pry medium sized rocks out of soil and loosen garden beds. Additionally, the tines are not particularly sharp. Sharp tines are not necessarily a characteristic of garden forks. The Fiskars fork is fairly long, at 47″, and is an excellent choice for those on the taller side. Shorter users may find this one a little bit unwieldy. With all that said, the flat-bladed tines are perfect for turning mulch, loosening gardening bed, or prying up moderately sized rocks or roots. It will be less effective for moving hay or similar materials, and of no use at all for loose earth or sawdust. We like Fiskars’ Spading Fork, but the plastic handle is a let down relative to some of the other forks on our list. The Radius brand name might not be quite as well known as Fiskars, but they put out an excellent line of hand tools for yard and garden. Their ergonomic gardening fork is no exception. This gardening fork uses a classic English design, with a moderate ergonomic twist. The handle is an O-loop rather than a flat edge on a D-loop. Unlike the Fiskars, the 203 Pro does have sharp tines which allows it to slide easily into packed earth or under trodden down layers of straw bedding. The O-loop is coated with a non-latex thermoplastic that creates a comfortable grip. The added length provided by the height of the O-Loop has the potential to make repetitive digging chores a little easier on taller people when compared to the more traditionally sized tools. Its all-metal construction promises many years of excellent use. When purchased in the U.S., it has a lifetime warranty. Awesome! 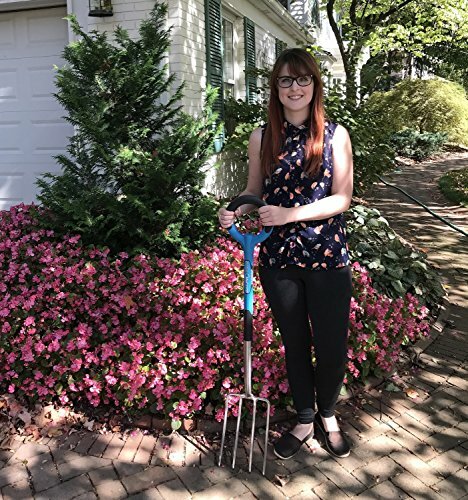 The Radius Spading Fork is an outstanding garden spading fork, and is a great choice, especially given its lifetime warranty! The O-shaped handle is quite comfortable, and the length is pretty comfortable for all users. It is the best heavy-duty garden fork on the market. The Truper spading fork is an old school spading fork, with a classic design. It is built using American ash, which is a traditional wood for axes, hoes, spades, and other tools. It is a dense wood with enough spring that it isn’t as brittle as hickory. As a handle for a spading fork, it flexes just enough to not break when abused. Of course, it doesn’t have the weather resistance of cedar or redwood, so be sure to bring your Truper inside when the job is done. The handle is a D-loop with the sides made of metal, while the flat part is wood. The fork has flat tines that are moderately sharpened. Truper is a Mexican company that exports to the United States and other countries. They make more than 5,000 different hardware items. They warranty their products to be free of manufacturer errors. Information and manuals for their products can be found on their website. Overall, the Truper gardening fork is a great choice, with robust build-out, classic design, and attractive price point. It’s got good heft, and is ready for hard work. For those on a budget, and for those who are on the shorter side, the Hoss is an excellent budget-friendly choice. Hoss is a company that focuses on gardening. Their products include garden hand tools, garden seed, and even equipment for food preservation. When their spokesperson says with pride, “Best garden fork on the market,” you know that he means it, and the pride in construction is evident throughout these spading forks. You can check out the spokesperson’s YouTube presentation. His obvious pride in the product says a great deal. 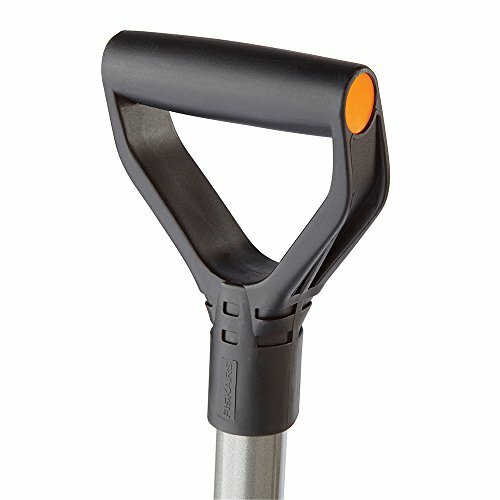 The garden fork from Hoss has a five-year warranty on the handle, which is made from aircraft quality steel tubing. The tines on the fork are flat with chisel-shaped tips. It has one other feature that is quite interesting: a foot protector for when you place your foot on the fork’s shoulder to press it into the dirt. It comes set up for a right-foot dominant digger, but all that is needed to swap the protector to the other side is to remove two screws, place it on the other shoulder and put them back in. For those of us who remember trying to press a spade or spading fork in the ground with a bare foot, this little touch is absolute genius. Hoss tools are made in America. 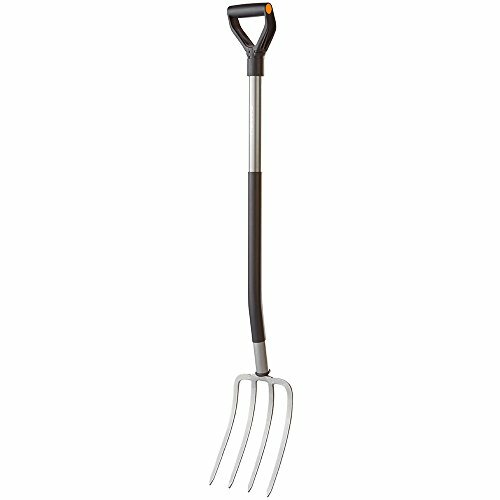 The Hoss garden fork is an excellent choice and is our runner up selection. It’s extremely well built, and we love the company. The length makes it a pretty good choice for gardeners of all sizes. 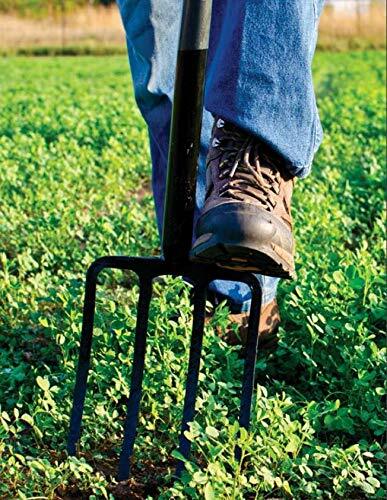 The Tabor Tools Digging fork is a sturdy implement, designed for heavy garden use. We like the Tabor Tools brand (especially Tabor Tools’ pruning saw), but in this case, the spading fork doesn’t have any distinguishing features that make it stand out beside the other four digging spades listed here. The overall length of 40″ puts it on the short end of middle-of-the-road, and those who are shorter will find this tool pretty comfortable. With that said, the steel shaft is a good feature, the D-Loop handle is easy on the hands, and it is almost as moderately priced as the Truper fork. 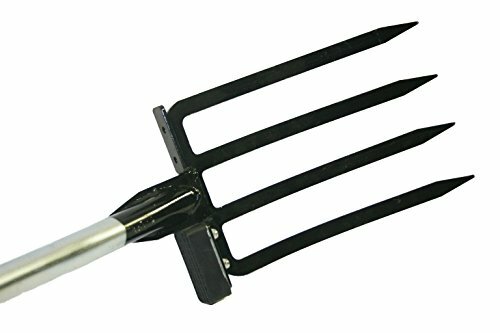 It is a solidly built, well-made spading fork. Its all-metal construction is an obvious plus, and this one will likely last until the robots do all of our gardening for us. While we like the Tabor Tools digging fork, it just doesn’t have enough stand-out features to make it particularly compelling to us, and it’s not quite priced at a point that makes it an attractive purchase. If this one is on sale, it may be worth getting, but if not, you’ll probably find a better option elsewhere on our list. 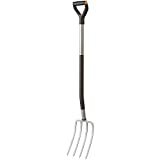 TABOR TOOLS J59A Steel Shaft Digging Fork, Super Heavy Duty 4-Tine Spading Fork, Virtually Unbreakable Garden Fork, 40” Length. Spading forks are often purchased as a sort of an afterthought when buying digging implements. But once you realize just what they can do in the way of loosening soil, scooping up produce out of the soil and working around roots and rocks, a good spading fork becomes a tool you don’t want to be without. The best heavy duty garden fork is the Radius spading fork. The O-Loop handle means a comfortable grip for strong work. At 42.9 inches, it is a clear winner if you are trying to avoid being bent double while digging. It is a winner in other ways, as well. The sturdy, all-metal construction plus the non-latex coating on the shaft and handle help preserve the tool so that it can be used for many years. The runner up in this list was difficult to choose. Each of the other four spading forks has excellent features, including the Fiskars. Fiskars had the ergonomic D-loop, Hoss has that nifty pad for your foot, Tabor provides all-metal construction, and Truper brings out that old-school classic use of ash wood as the shaft. With all of that said, we felt that the Hoss spading fork represented good value, and it is our runner-up pick. For those on a budget, it’s clear that the Truper Tru spading fork is an excellent option not only because of the low price point but also because it represents the traditional tool design and classic structure.